In small saucepan, bring vegetable stock and 2 tbsp (25 mL) of the oil to boil. Add couscous, lemon rind and cumin; stir to combine. Remove from heat and cover; let stand for 5 minutes. Fluff with fork and scrape into large bowl. Meanwhile, heat remaining oil in skillet over medium heat and cook, carrots for 5 minutes or until becoming softened. Add zucchini and cook for 3 minutes or until softened. Remove from heat and add walnuts. Add to couscous. 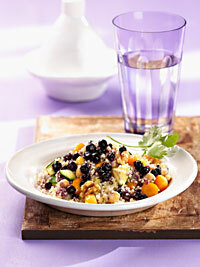 Add wild blueberries and chickpeas to bowl. Season with salt and pepper to taste. Add coriander and parsley and stir to combine well. Tip: Cover and store in refrigerator for up to 3 days.